The “Classroom Friends Game” is a terrific activity for helping students become comfortable with their new classmates. To play, students must find friends who meet the given criteria and add their names to the list. 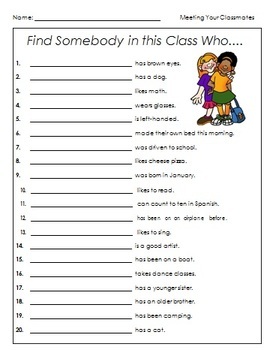 •	Students can list each classmate only once on the worksheet. •	Encourage students to spell names correctly. When they find a friend to add to their sheet, they should ask the friend how to spell their first name. •	Encourage neatness. Insisting that students demonstrate their best handwriting from the very beginning of the year sets a good precedent.